Hey Saraswathi, Congrats on your 300th post. great looking Carrot Halwa!! Congrats Saraswati and Hugs on reaching this milestone. The presentation is so good. Congrats on your 300th post..this is a real big milestone...the carrot halwa is looking really yum. congrats on d milestones,300th post n 4th anniversary..good yaar..
Congratulations on your 300th Post. Lovely dish to celebrate the milestone. Congrats saras....Looks so tempting...Keep rocking..
Congrats dear !!! keep rocking !! looks so delicious and yummy !! 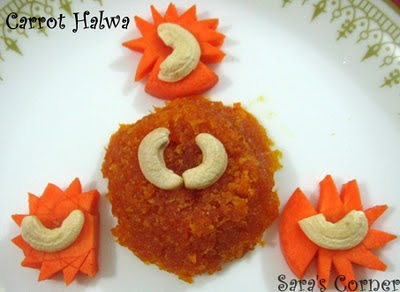 Carrot halwa is our favorite... This one looks so tempting..
Congrats on your milestone Sara..
Wow..Good going GAL.. Congrats.. Asusual ur recipe rocks today also..
Congrats,OMG what an awesome color. lovely clicks. Yummy halwa. Glad to follow u. Thanks for taking part in Create and Carve, the round up is now posted!